Like Merchant Ships: Pinecones, Anyone? We just had a gullywasher of a storm blow through. Every pinecone fell from our giant tree, landing all over the lawn. 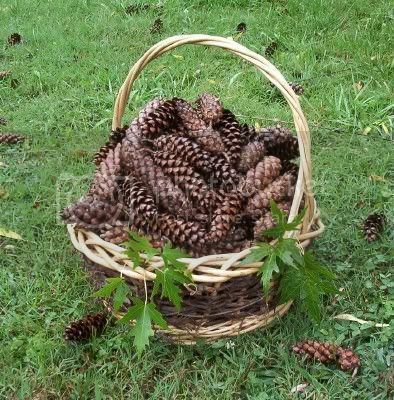 We grabbed some empty baskets and ran outside for a barefoot "pinecone hunt. "There are at least five more huge basketfuls to gather. Our holiday decorating will be heavy on the pinecones this year, don't you think?